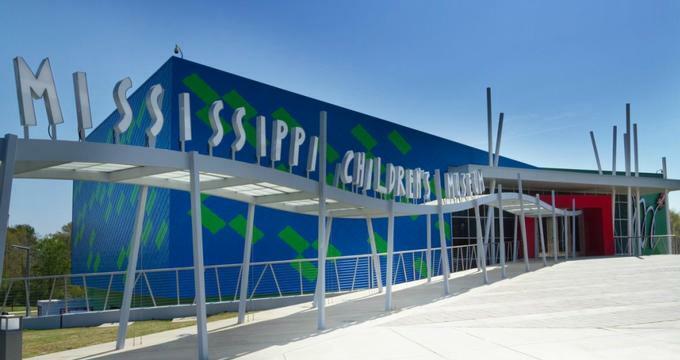 Located in Jackson, Mississippi, the Mississippi Children’s Museum is a 40,000-square-foot educational facility featuring five galleries of interactive STEM, art, and history exhibits for children, including a 13,000-square-foot outdoor Literacy Garden. The idea for the Mississippi Children’s Museum stems back to 1994, when a group of community volunteers began to advocate for a children’s museum facility to improve literacy and education among area children, inspired by similar children’s museum movements throughout the country. In 2003, the community group partnered with the Junior League of Jackson, which embarked on a $26 million campaign to find a permanent facility for the museum project. Museum exhibits were designed over the course of the next seven years in collaboration with educational partners, community leaders, and citizen volunteers. In December 2010, the museum opened to the public, and in 2014, major expansions included the opening of a sixth outdoor gallery, the Literacy Garden. Today, the Mississippi Children’s Museum is recognized as a national leader among children’s museums, receiving awards from the Association of Children’s Museum, Parents and Kids Magazine, and other leading educational organizations and publications, including recognition as a KidsCount Program of Promise. The museum has also been designated as a Let’s Move Museum, as part of the Let’s Move Initiative by Michelle Obama. More than 225,000 visitors explore the museum annually, including tourists from all 50 United States. Science, technology, industry, and mathematics are the focus of the museum’s World at Work Gallery, which features exhibits encouraging children to explore concepts related to STEM careers. Mississippi industries, including agriculture, construction, forestry, and energy production, are a major focus of interactive activities. Exhibits also encourage role play among children to emphasize career responsibilities and collaboration. At the Healthy Fun Gallery, health and nutrition concepts are introduced, focusing on body systems and healthy food options. Many exhibits are the result of partnerships with local health experts and educators, showing the food cycle through the human body and how healthy choices affect growth and development over lifetimes. Built-in active components also emphasize physical activities such as bike riding and climbing, encouraging exercise habits. In the Exploring Mississippi Gallery, the museum’s home state is honored with interactive exhibits, including a climbing map of the state emphasizing local geography and culture. State geographical and historical features, such as the Natchez Trace and Mount Woodall, are highlighted. Cultural arts are emphasized in the Express Yourself Gallery, which offers hands-on visual and performing arts activities designed to foster creativity and exploration. Music and dance rooms are offered, as well as an Inspirations Studio, which contains a drafting table, audiovisual equipment, and workstations for painting, sculpting, and crafting. An Outside the Lines Gallery also encourages freeform collaboration and messy projects, including spin art and soft sculpture. Literacy is the focus of two galleries, including the Wild About Reading Gallery, which teaches reading and writing basics about sounds, letters, and parts of speech. Inspired by a poem by Sherry Norfolk, the Museum’s new 13,000-square-foot Literacy Garden is an outdoor learning space also focused on literacy education for children up to eight years old, featuring literary-inspired structures, an edible garden, and other play spaces designed to encourage imagination and storytelling skills. In addition to permanent exhibit galleries, a number of temporary gallery exhibits focus on familiar storybook characters as well, including the 2017 Curious George: Let’s Get Curious touring exhibit. The Mississippi Children’s Museum offers a variety of educational programming for children, tailored to Mississippi state curriculum standards at all levels. An ABC Come Play With Me group meets on Wednesday mornings for infants and toddlers, featuring storytime, stretching, and a group art project. Once a month, a Shake out the Sillies movement group encourages exercise through dance and yoga forms. Saturday morning Know to Grow programming at the Literacy Garden also encourages hands-on movement and activity, featuring storytime and gardening activities, and a Fueled for Adventure program at the museum’s Red Rocket Cafe teaches participants how to prepare healthy recipes. A monthly Question It? Discover It! program is held for children and families to encourage healthy habits, sponsored by the Children’s of Mississippi hospital. Tinker with Tuesday maker workshops focus on STEM principles and creativity, and monthly visiting artist sessions, sponsored by the Mississippi Arts Commission, provide an opportunity for children to work directly with local artists and crafters inside dedicated studio space. A weekly Farm Bureau Spotlight lecture and discussion program also emphasizes the role of food and agriculture in daily life.